The world is supposedly divided into “dog people” and “cat people,” but horse people are on both sides of the fence. Just about every barn has its loyal canine mascot or two, and of course a bevy of barn cats. If showground rules permit, you’ll typically find dogs by the dozen at equestrian events. At the Rolex Kentucky Three-Day Event each year, I find the variety of canine companions that accompany the horsey crowd a favorite sideshow (check out photos here). The event itself is extremely dog friendly, with doggie daycare, watering stations for the pooches and more. On the flip side, at this year’s event a loose dog on the cross-country course interfered with Buck Davidson’s ride on Ballynoe Castle RM by running up to the horse’s hind legs with snapping teeth, apparently causing him to refuse a fence. The penalty was ultimately reversed and both dog and horse were safe, but it could have been a terrible wreck. Despite the passion we have for both our dogs and our horses, the two don’t necessarily come together without care. Thought and training must go into creating responsible canine companions to keep everyone safe at the barn, on the trail, and in public, such as at horse shows. 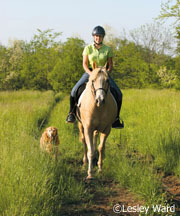 We also have to be honest with ourselves about our animals’ temperament, level of training and tolerance. This month, author Marcia King talked to training and behavior experts as well as experienced equestrians to compile hands-on advice to teach your dog some horse sense. For the making of a well-behaved barn dog, read, “Top Dog.” Plus, meet some barn dogs of great character in this month’s HI Spy.